Apple’s third-generation iPad is hot, but this time in a good way, says Consumer Reports. The consumer reviews magazine created a stir two weeks ago when it said the latest Apple tablet could get as hot as 116 degrees Fahrenheit in some spots when running games. Despite that finding, CR on Monday gave the new iPad the top spot in the magazine’s tablet ratings. CR’s decision is in line with many gadget critics who have lauded the iPad for its 2048-by-1536 display, 5-megapixel rear-facing camera, and 4G access. PCWorld in mid-March ranked the new iPad as the top tablet money can buy giving the tablet 4.5 out of 5 stars. Poll results from ChangeWave Research. Buyers of the new iPad are also overwhelmingly satisfied with their tablet, a survey conducted March 22 to 28 by Bethesda, Md.-based ChangeWave Research shows. 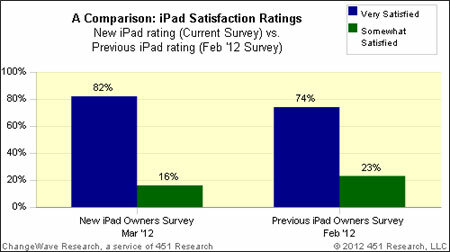 Eighty-two per cent of owners were very satisfied with the new iPad, and 16 per cent were somewhat satisfied. That is even better than the iPad 2’s rating given in February 2012, with 74 per cent very satisfied with the tablet and 23 per cent somewhat satisfied. 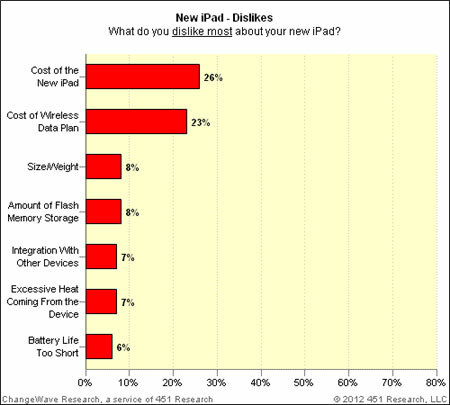 The new iPad’s heat wasn’t a hot button issue for consumers, according to ChangeWave Research. Only four per cent described it as “somewhat of a problem” while 89 per cent say they have no problem with excessive heat. Consumers were much more likely to name cost of the tablet (26 per cent) or attached wireless data plan (23 per cent) as chief concerns. One interesting difference between Consumer Reports’ findings and PCWorld’s was in the device’s battery life. CR said the “iPad still has longer battery life than all other tablets.” PCWorld’s tests, however, found the third-generation iPad’s battery life couldn’t match other tablets including the iPad 2, the Asus Eee Pad Transformer Prime, or the Wi-Fi only Samsung Galaxy Tab 10.1. Similar to CR, PCWorld Labs testing also found that Apple’s newest tablet charges only minimally when in use. Apple’s newest iPad is the first iOS slate to feature 4G connectivity, the device also has a dual-core Apple A5X chip with enhanced graphics capability, Bluetooth 4.0 and 802.11a/b/g/n Wi-Fi, and a 5-megapixel camera with 1080p video capture at 30 frames per second. The iPad (third generation) ranges in price from $519 to $849 depending on storage and connectivity options. The new iPad was initially sold out after high demand from online pre-orders in Canada. But a call in to the Apple Store in Toronto’s Eaton Centre confirms the new tablet is currently in stock. With notes from ITBusiness.ca staff.